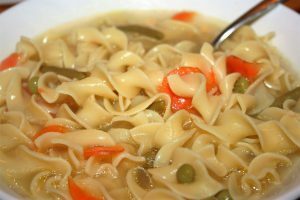 This soup is so similar to Granny’s Chicken Soup but just enough different to share. Here’s the deal. We’ve been fighting off feeling yucky around here. Saturday is usual homemade pizza night but Sean was feeling a bit achy and stuffy and asked if I had any soup on the menu that we could have instead of pizza. (I knew he wasn’t feeling good because he was the one that was instrumental in bringing back pizza night.) 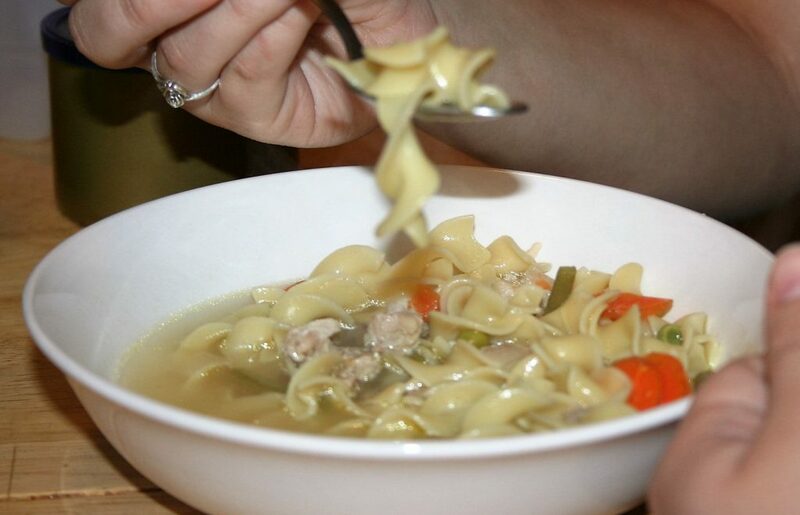 I did not but I had a chicken thigh in the freezer and could throw together a chicken soup with wide egg noodles. This was acceptable and much appreciated. Well, then yesterday Tiffany was fighting off the same yuckiness and wondered if I could make some more soup. Thankfully I had a couple more thighs in the freezer. Granny’s soup has potatoes in it and super thin egg noodles. This has no potatoes and wide egg noodles. Granny’s has chunks of carrot that you mash with a fork; this has thin slices of carrot that cook quickly. Those are the differences. Oh! 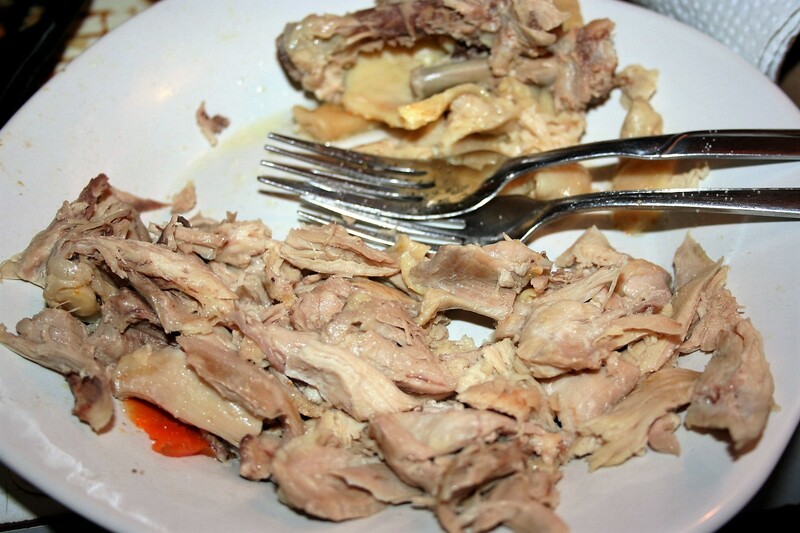 Granny’s chicken soup uses a whole chicken, whereas this uses whatever pieces I have–preferably some piece with the skin and the bone. This is a throw it together kind of soup. One that uses whatever you have on hand that sounds good at the time. Fill the pot up with water, however full you need for your family. I fill my 6 quart dutch oven about 2/3 full. Add the chicken piece or pieces. I had one large boneless thigh on Saturday and two small thighs with skin and bones on Monday; both worked fine. Add a thick slice of onion, one rib of celery, and one thinly sliced carrot. Add whatever you like. Yesterday I added about a quarter cup of frozen peas and about a half cup of frozen green beans, broken into bite-size pieces. 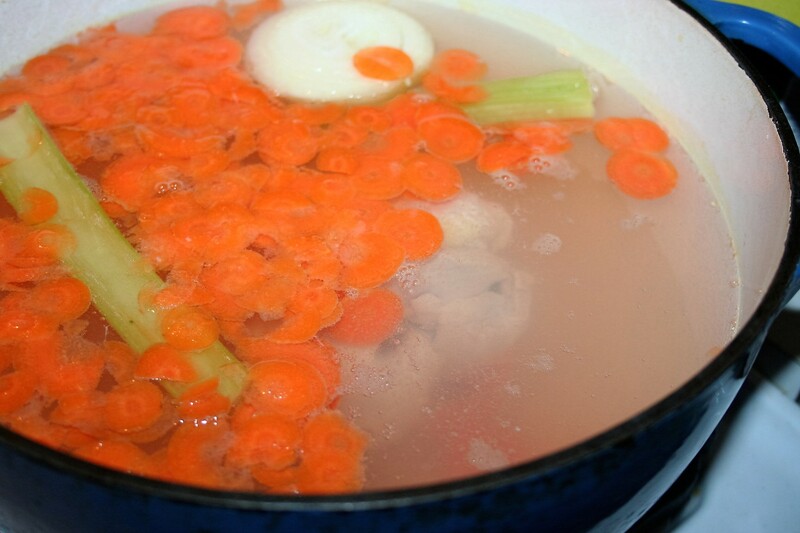 Bring it to a boil and then simmer until the chicken is done. When the chicken is cooked through and veggies are tender, about 30 minutes, remove the chicken, onion, and celery (unless you want to eat the onion and celery but I only put them in for seasoning). Return to a boil and add in as many wide egg noodles as you like. I added more today than I did Saturday; it’s really about what you want. 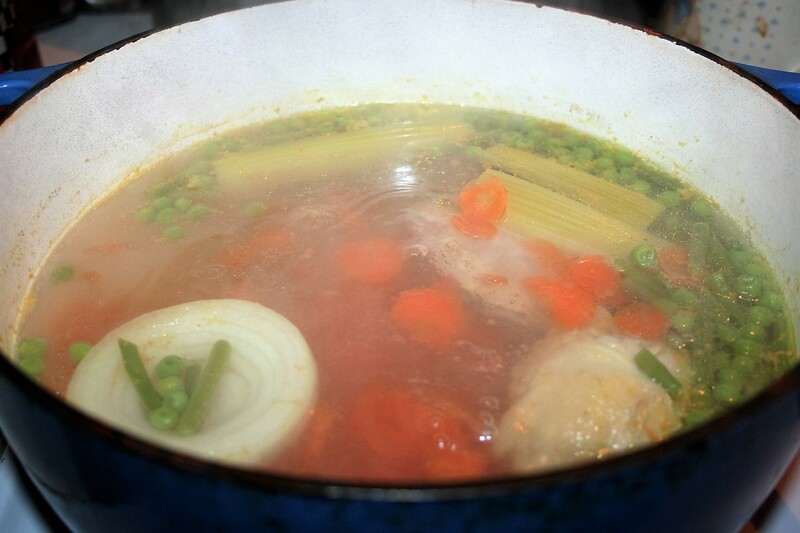 Add more water or chicken broth, if needed. When I reheated this later for Tiffany, I added a glassful of water and about a half tablespoon of Better than Bouillon. 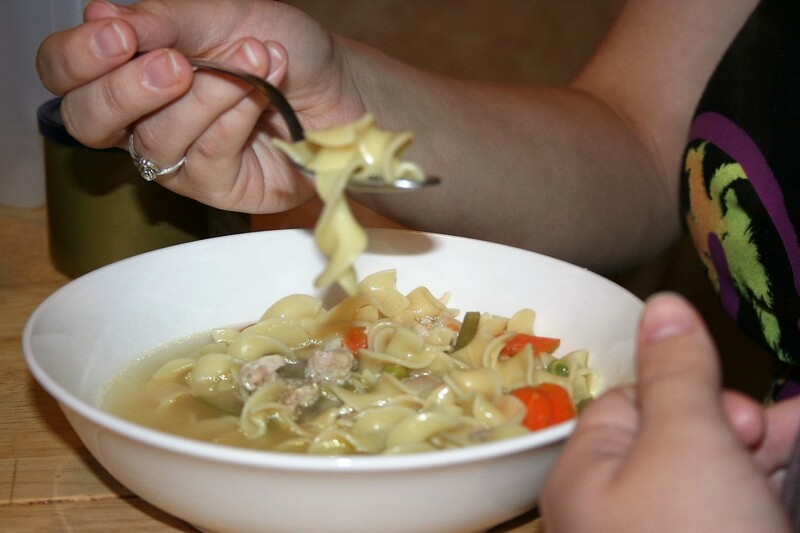 While the noodles are cooking, remove the meat and skin from the bone, if there is one. Shred or cut up the meat and add it back to the soup. 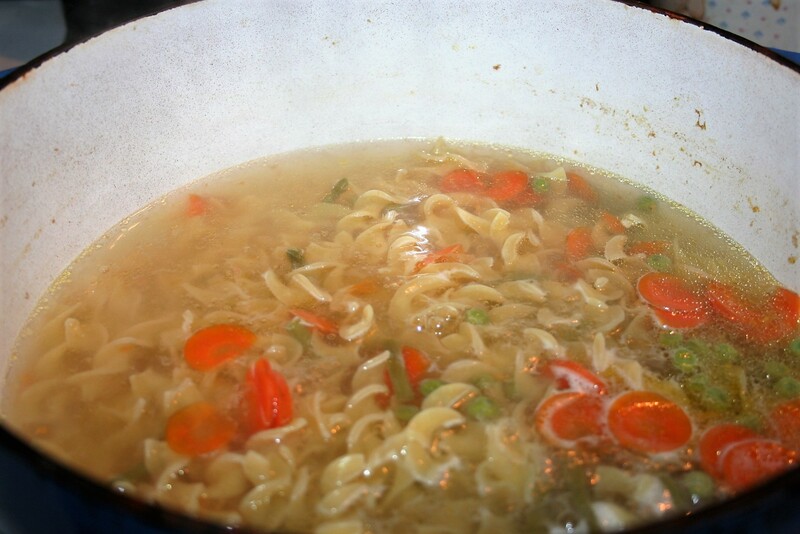 When noodles are cooked through, about 8 minutes, it is ready to serve. Serve with a nice soft piece of bread and you have a very comforting and satisfying dinner.